Outlander continues with the binary stories with Jamie imprisoned and the continued deterioration of Claire’s relationship with Frank. As I’ve mentioned in the past I find the Claire and Frank scenes problematic because Claire isn’t portrayed in the best light. Her characterisation is consistent so it’s clearly deliberate but she is consistently unfair to Frank and the strain caused in their relationship is entirely her doing. Another issue is that the plotting feels far too rushed which doesn’t allow for proper exploration of their relationship. It almost feels like a clip show as many of the scenes feel completely unconnected though they follow a similar theme. In this case the theme is that of emotional separation. Claire and Frank have come to an arrangement that allows both of them to see other people while keeping up appearances for the sake of Brie. This is established early on when Claire suggests spending an evening out together and suggests films that they could watch. Frank has already seen them with a woman he has been seeing and assures Claire that he’s being discrete. The idea behind this is sound as it creates a really awkward situation where Frank is indulging a sham marriage for the sake of a child that isn’t biologically his. It’s clear that Frank is devoted to Brie and the snippets of the bond between them we see feels genuinely deep but the issue is that very little time is spent exploring this. In theory the sham marriage should be affecting Brie in some way. Even if she doesn’t realise the details of what’s going on she would probably be aware that something isn’t quite right. The opportunity for that to be made apparent existed when the woman Frank is seeing turns up during Claire’s graduation party but unfortunately this isn’t the focus of the scene. We also don’t really get a sense of Claire’s relationship with Brie. Years pass between scenes and Brie cameos in them but there’s no indication of the kind of person she is or how she relates to her parents. The ingredients were there for meaningful interactions but the potential goes unfulfilled. Frank continues to be an engaging and sympathetic character who is making the best of a bad situation. Claire has put him in an impossible position as Frank has devoted his life to her but she doesn’t return his affection. For the most part he conducts himself with dignity but the frustration comes to a head eventually. It doesn’t help that Claire has unrealistic expectations of him and chastises him after the woman he is seeing comes to their home. It was a genuine mistake as Frank got the times mixed up but Claire reacts with anger and it results in an argument. Frank’s line about there being too many people in their bedroom was especially poignant as it shows how difficult he finds Claire’s obvious devotion to Jamie. The fact that Brie constantly reminds her of Jamie is especially difficult for him because he’s a looming presence over their sham marriage. Frank can’t let go of Jamie any more than Claire can but his reasons are very different. Another effective scene was the argument involving taking Brie to England. This is the point where Frank has finally had enough and asks Claire for a divorce. She accepts but won’t let him take her daughter. She essentially throws everything he’s done for them back in his face by reminding of the fact that she isn’t biologically his. It’s harsh, emotionally charged and completely unkind. Frank retaliates by suggesting that Brie would happily choose to go with him which seems like a reasonable reaction given the circumstances. Frank’s death at the end of the episode feels largely glossed over. As I’ve said the storytelling is rushed which means that the emotional moments lack impact. 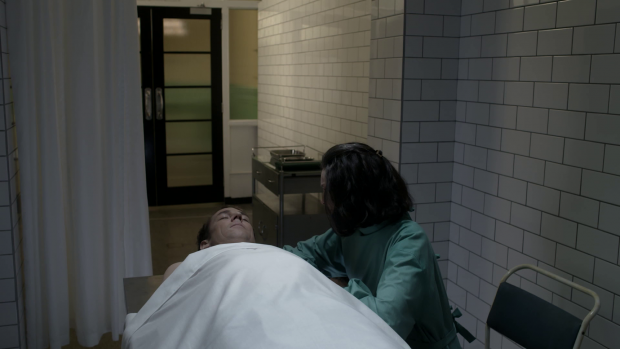 There is mention of an accident and then Claire weeps over his dead body. It’s a good scene and Caitriona Balfe performs well though the content betrays the lack of development in their relationship. Claire says that she loves him and that Frank was her first love which may be true but the previous episodes haven’t really established this. There has been no indication that Claire loves Frank up to this point though spending more time on them may have fixed this. We are also robbed of Claire’s promising dynamic with Joe suggested at the end of the previous episode. The university setting had a lot of potential as there was an opportunity to explore the reaction Claire and Joe have to not being treated as equals because of race and gender roles at that time. University isn’t something we see at all unfortunately as this episode skips straight to the graduation. All we get as viewers is the highlights rather than the detail and it’s the detail that I want to see. Jamie’s story is far better handled. It feels like these scenes come from a completely different show written by people who are concerned with delivering the detail that is lacking in Claire’s narrative. Jamie’s surroundings are changed to the prison for this episode which gives him far more agency than he was allowed in the previous episode because of his surroundings. He quickly establishes himself as someone to be both feared and respected. The guards are all afraid of him and he speaks on behalf of the prisoners. This information is given to Lord John Melton (David Berry) when he takes charge of the prison. He is informed that it’s a good idea to establish a regular dialogue with Jamie as it will make his job a lot easier. At first he’s reluctant but quickly realises that it makes sense to do so. These conversations are fascinating and John is a really interesting character. He has a job to do but also wants to treat his prisoners with dignity and respect. This is seen repeatedly and it’s also established that his resources are limited which means that there is only so much he can do. John and Jamie’s conversations are adversarial in nature though there is a mutual respect that develops between them over time. Jamie just wants the best for his fellow prisoners and John wants to make sure the prisoners are content enough to be obedient so they have similar goals. Jamie does slowly earn his trust which allows him to negotiate for more perks for the prisoners. This quickly results in Jamie escaping and showing John how dangerous he is. He refers back to the time he saved John’s life and gives him the opportunity to make good on his promise to kill him. John further demonstrates his integrity by refusing to kill him because Jamie is an unarmed prisoner and that’s not something he believes is right. The best scene was when John confided in Jamie about his reasons for joining the army and talks about the man who inspired him as well as how hurt he was when he wasn’t able to see him die. Jamie sympathises with the situation and confides in him about Claire and how he feels now that he has lost her. Amusingly he also tells John about the deception they crafted to get him to talk and Jamie acknowledges him as a worthy foe with strong values and a compassionate demeanour. John’s relationship with Jamie develops organically across the episode but gets to the point where John thinks that it has developed further than it has. He attempts to initiate an intimate encounter but Jamie takes exception to this and threatens to kill him if he doesn’t back away. John clearly read the signals wrong and is apologetic but also seems genuinely rejected. He calls it a “moment of weakness” but there could be more to it than that. 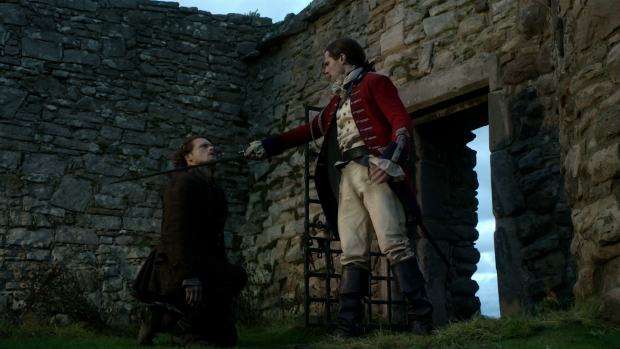 David Berry plays the sense of rejection perfectly and Sam Heughan’s reaction is terrifying. 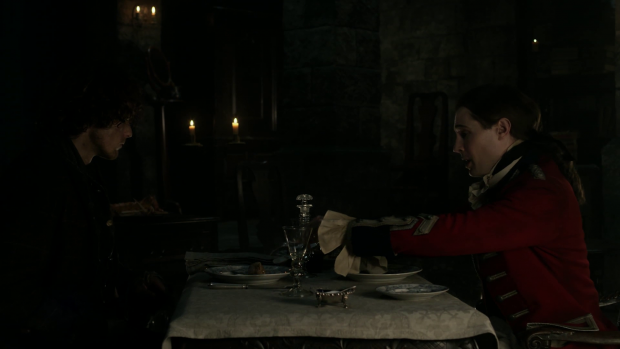 There weren’t many scenes showing Jamie interacting with his fellow prisoners though the strongest was when he described every detail of a meal he shared with John to boost their morale. The imagination is a very powerful thing and it’s clear that imagining the taste of the food brought them joy. Now that Frank is dead, Brie is an adult and Jamie has been freed we may be at the point of last season’s finale where Claire is ready to return to Jamie’s time period and reunite with him. Having them separated has been a problem for the show as the core relationship was always so engaging but there was a lot of potential in exploring how they function apart from one another that has been well developed from Jamie’s point of view but less so from Claire’s. More episodes could have been spent exploring the years they spend apart rather than rushing to their reunion. It will be good to see them interact once again. An uneven episode that explores Jamie’s part of the story well but fails to develop Claire and Frank in any meaningful way. The problem with Claire’s story is that the plotting is so rushed that there’s no time to dig into the detail of the interactions. Claire isn’t in the best light in the way she treats Frank and there’s no real sense of her relationship with Brie as she essentially cameos in the various scenes. Frank continues to be sympathetic and engaging but his death feels largely tacked on and does him a disservice. Jamie’s developing relationship with John is fascinating to watch unfold. John is a fair minded man with integrity and clearly respects Jamie to the point that he tries to initiate an intimate encounter. Jamie and John’s relationship is broadly adversarial but there’s an undercurrent of respect to it which means that Jamie can campaign for better treatment for his fellow prisoners. It’s a fascinating dynamic and the scenes between them are really interesting to watch. David Berry is great in the role and the character is engaging. It now appear that Claire and Jamie will soon reunite which is a good thing as the core relationship will reappear but there was more potential in having them apart than the episodes have explored. We’d love to know your thoughts on this and anything else you might want to talk about. You can find us on Facebook and Twitter or just leave a comment in the comment section below. You’ll need an account for Disqus but it’s easy to set up. For me, this is my favorite episode of S3 so far. I am biased because I have read the books. However, I try to keep my enjoyment of the show separate from the books. I think the show writers are doing a great job of filling in the Claire-Frank story. As for my thoughts on [TV] Claire’s character – to me, her development makes sense. In Jamie’s story, the introduction of Lord John was well adapted. A lot more goes on at Ardsmuir in the book than what made it to the screen. Murtagh – adds a new dynamic. I look forward to seeing how his character is included in the overall story (S4 and beyond). In the book, he died at Culloden. The show writers may have to exclude another important book character not yet introduced on screen to best adapt Murtagh’s continuation in the TV series. My apologies for not replying to this sooner – time has been very limited. My feeling on the Claire/Frank story is that there was so much more there than we have seen. As I said it spans years between scenes and there’s very little depth there, certainly the mother/daughter relationship should have been part of it. I feel that an entire season could have been spent getting to the point where they meet again. The popularity of the show would certainly allow for that. It’s interesting to see how the TV producers of the series adapt the book. Basically in the books, most of the first chapters of Voyager are about Jamie, Claire’s story is told more as reminiscence later in the books, clearly for the TV series viewers would be wondering what’s happening to Claire, so they’ve really padded that aspect out. They’ve also made Frank a far more sympathetic character. I’ not sure I’ve worked out excatly why – maybe because Claire could come across as a bit ‘Mary Sue’ if she’s always in the right? 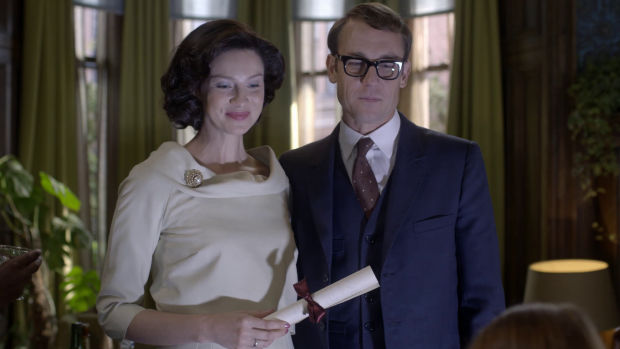 The Claire/Frank relationship, indeed all the relationships in Outlander, have depth behind them. I don’t come down on one side with Claire and Frank. If you check through their history, it was Frank who insisted he’d stand by Claire and the baby, even though Claire no longer felt the same for him and made that clear. They’ve agreed on an open relationship, but note that Claire isn’t sleeping with anyone! This is what a lot of couples do – stay together for the kids, often one wanting more than the other. There’s genuine companionship between Claire and Frank, no doubt Claire was settling into blind complacency and felt shocked at the news of Frank’s new relationship. I don’t see her as being cruel to Frank, more that she can’t be with him as a woman any more because she’s experienced a deeper love with Jamie. This is a very common human experience – you can’t act ‘in love’ for twenty years if you don’t feel it and have experienced something far deeper. Interesting take on it. I do agree that Claire could easily descend into “Mary Sue” territory so I actually like that I’m not seeing her in a favourable light this season. It adds complexity to her as she’s someone who doesn’t always do the right thing. My main issue with the Claire/Frank relationship is that so much of the detail is skipped. I think there’s an entire season of potential in chronicling Jamie’s life and Claire’s life, maybe the format could be split so that one episode is all Jamie and the next is all Claire. More time would probably fix many of the issues as it would allow for exploration of why Claire feels the way she does and why Frank’s resentment deepens as a result. His off screen death was a disservice. I do agree that what they were trying to do is as you’ve put it but as I’ve said I wanted to see it explored. Thanks for commenting, hope you enjoy the reviews.